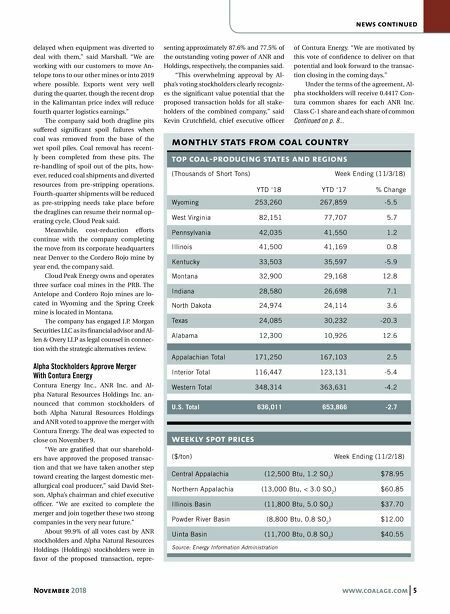 4 www.coalage.com November 2018 news Coronado IPO Raises $774 Million b r e a k i n g n e w s Ramaco Resources' Elk Creek Has Partial Structure Failure On November 5 at about 1 p.m., one of three raw coal storage silos that feed Ramaco Resources' Elk Creek plant in West Virginia experienced a partial structure failure, which included various components internal to the silo. The damaged storage silo holds 2,000 raw tons of coal. The company is in the process of evaluating the structural integ- rity of the damaged silo, and similar evaluations will be conducted on the other two silos at Elk Creek. All three silos were on the Elk Creek property when it was acquired by Ramaco in 2012, and were linked into the newly constructed preparation plant and loadout facility, which was completed in late 2017. There were no personnel related accidents as a result of the structural failure at the silo. The Elk Creek preparation plant was idled and a safety zone was placed around the areas that could potentially be impacted from a more severe failure. 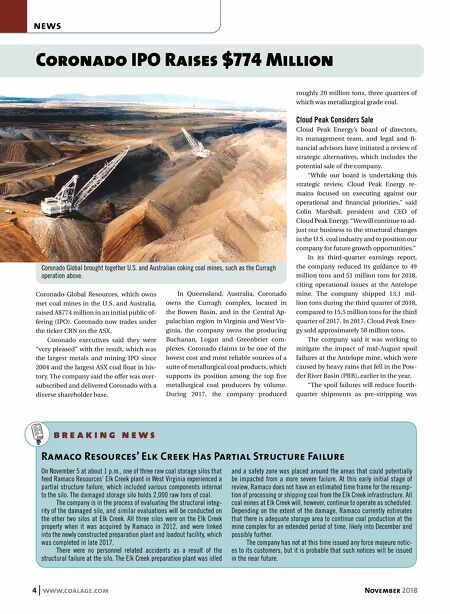 At this early initial stage of review, Ramaco does not have an estimated time frame for the resump- tion of processing or shipping coal from the Elk Creek infrastructure. All coal mines at Elk Creek will, however, continue to operate as scheduled. Depending on the extent of the damage, Ramaco currently estimates that there is adequate storage area to continue coal production at the mine complex for an extended period of time, likely into December and possibly further. The company has not at this time issued any force majeure notic- es to its customers, but it is probable that such notices will be issued in the near future. Coronado Global Resources, which owns met coal mines in the U.S. and Australia, raised A$774 million in an initial public of- fering (IPO). Coronado now trades under the ticker CRN on the ASX. Coronado executives said they were "very pleased" with the result, which was the largest metals and mining IPO since 2004 and the largest ASX coal float in his- tory. The company said the offer was over- subscribed and delivered Coronado with a diverse shareholder base. In Queensland, Australia, Coronado owns the Curragh complex, located in the Bowen Basin, and in the Central Ap- palachian region in Virginia and West Vir- ginia, the company owns the producing Buchanan, Logan and Greenbrier com- plexes. Coronado claims to be one of the lowest cost and most reliable sources of a suite of metallurgical coal products, which supports its position among the top five metallurgical coal producers by volume. During 2017, the company produced roughly 20 million tons, three quarters of which was metallurgical grade coal. Cloud Peak Considers Sale Cloud Peak Energy's board of directors, its management team, and legal and fi- nancial advisors have initiated a review of strategic alternatives, which includes the potential sale of the company. "While our board is undertaking this strategic review, Cloud Peak Energy re- mains focused on executing against our operational and financial priorities," said Colin Marshall, president and CEO of Cloud Peak Energy. "We will continue to ad- just our business to the structural changes in the U.S. coal industry and to position our company for future growth opportunities." In its third-quarter earnings report, the company reduced its guidance to 49 million tons and 51 million tons for 2018, citing operational issues at the Antelope mine. The company shipped 13.1 mil- lion tons during the third quarter of 2018, compared to 15.5 million tons for the third quarter of 2017. In 2017, Cloud Peak Ener- gy sold approximately 58 million tons. The company said it was working to mitigate the impact of mid-August spoil failures at the Antelope mine, which were caused by heavy rains that fell in the Pow- der River Basin (PRB), earlier in the year. "The spoil failures will reduce fourth- quarter shipments as pre-stripping was Coronado Global brought together U.S. and Australian coking coal mines, such as the Curragh operation above.